5310 Grove Manor, Lady Lake, FL.| MLS# 549627 | Spruce Creek Realty...Retirement Communities in Florida, Resale Homes In Spruce Creek South, The Villages, Stonecrest, Del Webb. 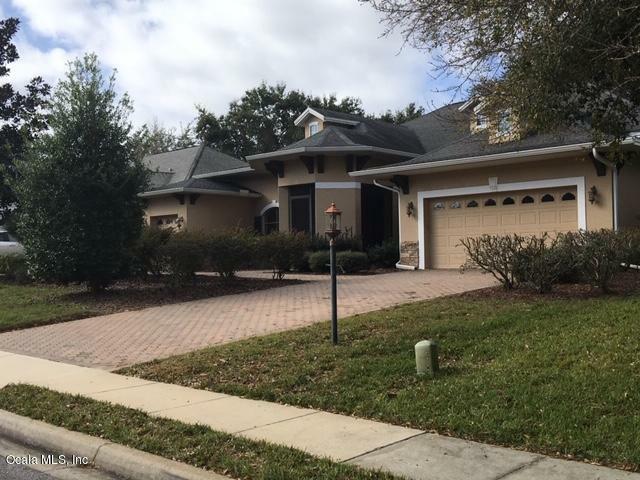 Don't let this one get away, move-in ready pool home in The Grove Harbor Hills gated community by Lake Griffin. Mature landscaping with architechal details add to curb appeal. Pavers lead to the covered entrance. The open floor plan w/10ft ceilings and huge windows add to the luxurious feel of this home. French doors open to the gorgeous pool area. Tile in all living areas with handscraped laminate wood floors in all 3 bedrooms. The open kitchen has quartz counters and breakfast bar with SS appls. Master has 2 large closets and master bath has 2 sinks, large garden tub and walk in tiled shower. Built ins in both bedroom closets. Office/den w/ tile floors and double doors for working at home. 8ft doors throughout.